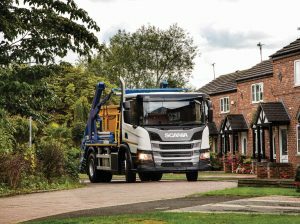 Scania has launched a fully built-up skiploader based on its 18-tonne New Generation P-series chassis. Developed in conjunction with market leading skiploader equipment manufacturer, Hyva, the vehicle is available for order from any Scania UK dealer network sales outlet. The Scania Skiploader is available in either day-cab or short day-cab format, with steel suspension front and rear. Designed for economy and ease-of-operation, Scania 7- or 9-litre engines can be specified, with power steps of 220, 250, 280, 320 or 360hp. Transmission is Scania’s eight-speed GR875 range-change gearbox with fully-automated, two-pedal Scania Opticruise gear selection system. To maximise flexibility in operation, up to three performance modes from a choice of Standard, Economy, Power or Off-road can be selected. Scania’s R660 rear axle with differential lock completes the driveline. While utilising a standardised range of componentry, the Scania Skiploader also offers a wide choice of option to ensure every need can be satisfied. In addition to being competitively priced, the vehicle is fully supported from new with a comprehensive two-year repair and maintenance programme, which can be extended.